The Pilot House Pullover is one of the designs created especially for our fall 2014 make. wear. love. sweater retreat. Our fall retreats are always held in a beautiful spot in coastal Maine where I grew up, and I try to create sweaters that would be at home in the region. 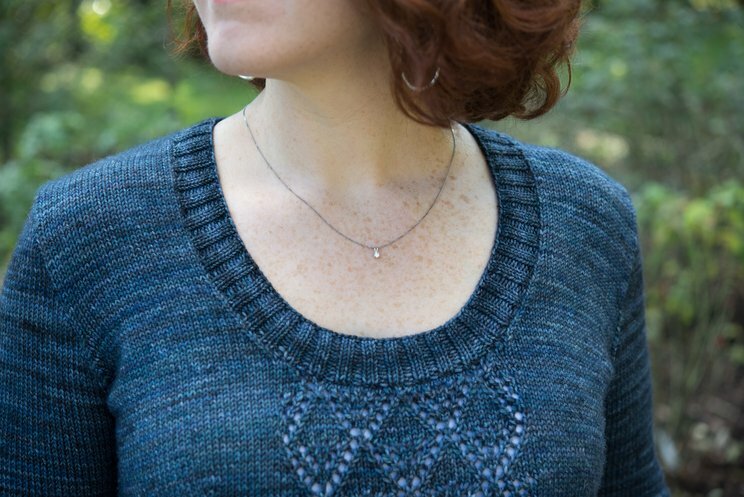 The Pilot House Pullover is definitely "dressing up" fare, in my hometown, but who doesn't like to be a bit fancy every now and again? 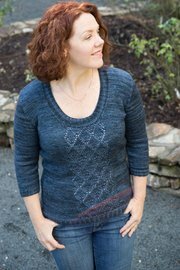 It's a comfortable, simple pullover to knit, with a diamond lace panel and simple scoop neckline. The lace adds a nice visual touch without fighting with the gorgeously-shaded colors of a hand-painted yarn. It also provides interest for the knitter in an otherwise-simple design. I recommend choosing either a 'close' or 'average' fit for this pullover, which looks best when worn either next to the skin or with a thin layer. On the number of lace repeats: We calculate the number of lace repeats in each individual Pilot House pattern so as to ensure that the lace will never extend outside of your neckline stitches. This means that the number of repeats will vary from knitter to knitter, depending both on gauge (smaller gauges mean more repeats than larger gauges) and on body (the fewer stitches in the neckline, the fewer repeats). If you would prefer a different number of repeats in your Pilot house, please feel free to alter the number repeats by placing your markers around a different number of stitches when working your sweater front. Please note that if you increase the number of repeats, you’ll have lace stitches continuing up to the shoulder. On gauge: Generally speaking, your gauge in the lace panel should be similar enough to your Stockinette gauge not to unduly affect the width of the front. But checking this is always a good idea! If your gauge is substantially looser in the lace, you can remove stitches from the front cast-on without harm (you’ll have to adjust the number of neckline decreases to account for this change). 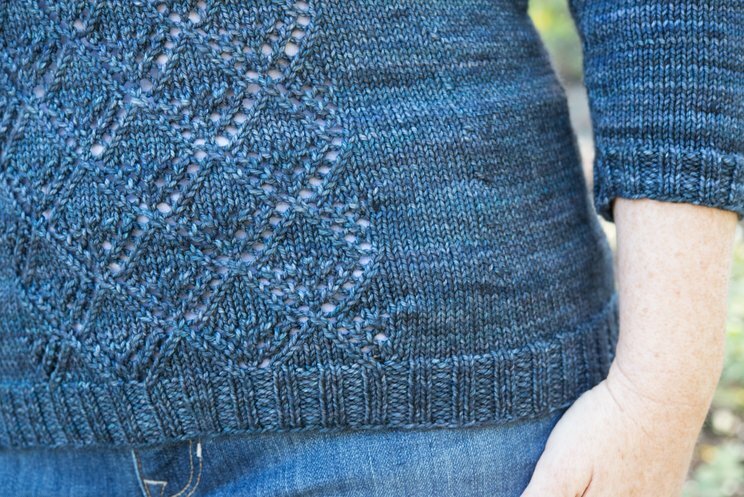 For this sample, I used The Woolen Rabbit's Sporty Kashmir in the colorway "Forever in Blue Jeans". This yarn is an incredibly soft, 3-ply Sport Weight and is made from 80% superwash merino, 10% cashmere, and 10% nylon. I highly recommend it! If you're using this yarn, you should aim for a stitch gauge of around 6 stitches to the inch to get a fabric like the one shown.